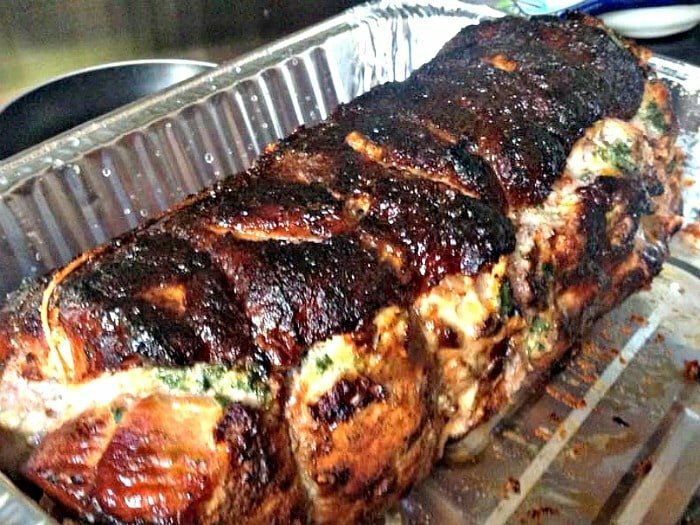 Brown Sugar Roasted Pork Loin with Cream Cheese Stuffing. 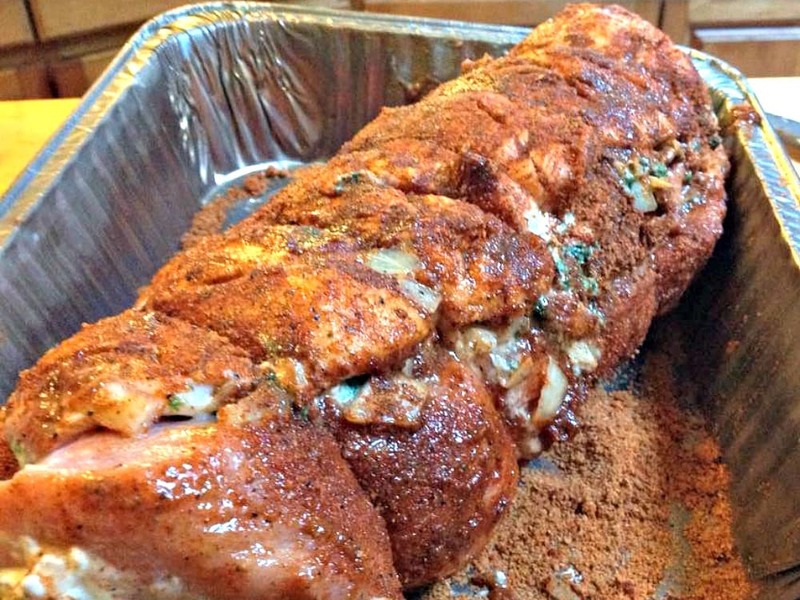 This is a lovely flavorful recipe and sure to keep your pork loin juicy and tender. The stuffing is made up of spinach, onion, peppers and cream cheese. 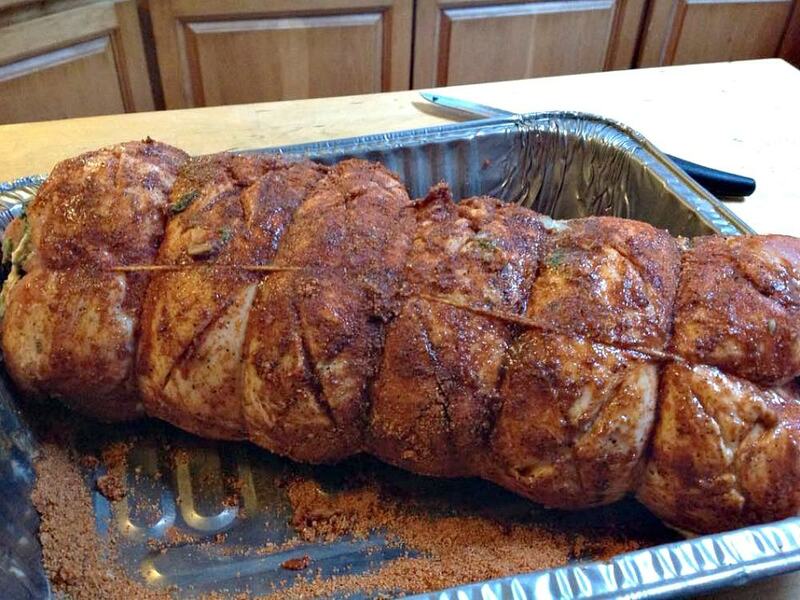 Then the loin is rubbed in a wonderful brown sugar spiced mix, and simply roasted. It can be a little tricky to know how to butterfly the pork loin so we’ve added a really nice video below so you can see just how easy it is to do, once you know how! If you don’t want to do it yourself, you can always ask your butcher to do it for you. This dish will make a lovely meal for any occasion and although it is a straightforward recipe, it is fancy enough to serve for a dinner party or special occasion too! 3.5 lb or 1.5 Kg joint of Pork Loin. 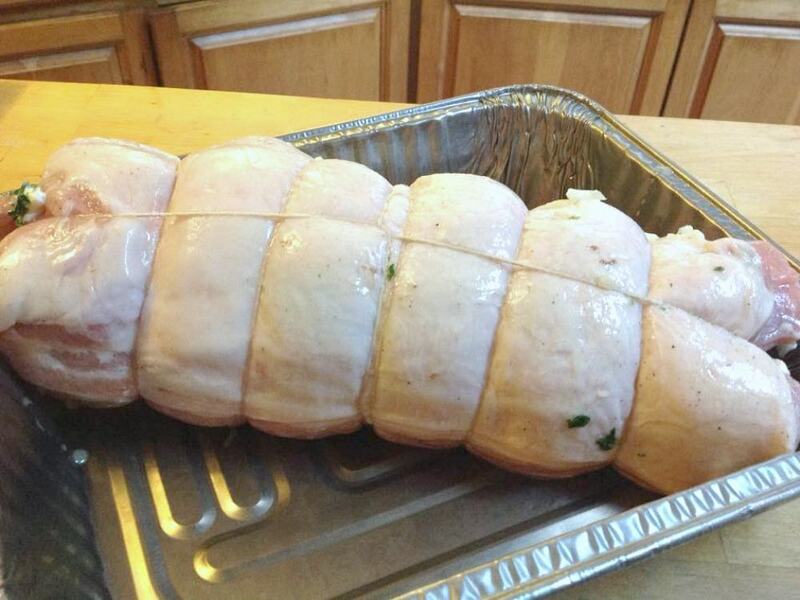 Prepare the pork loin so it is ready for stuffing and rolling. 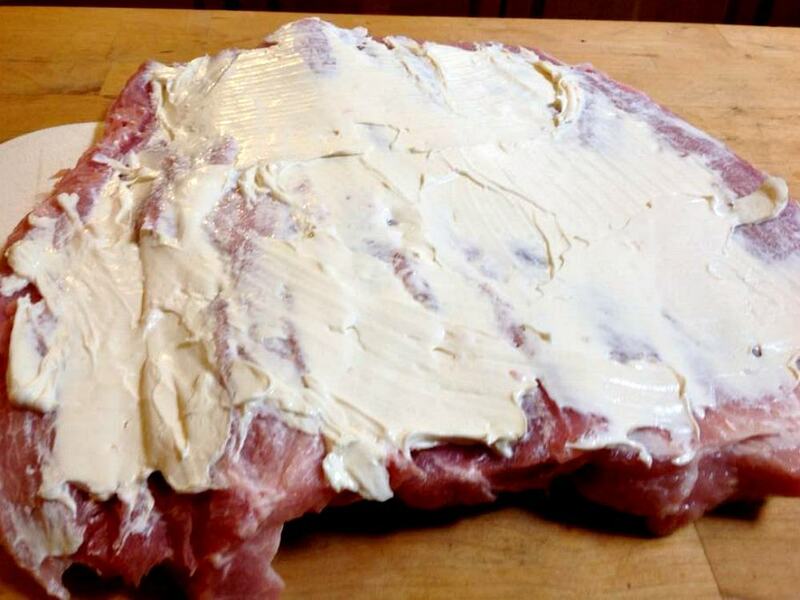 The easiest way to show you is by watching this video on how to cut the joint of meat. You just need to watch the first 3 minutes. Once the pork is flat and laid out, spread the cream cheese all over, then season with salt and pepper, garlic salt and dried basil. Add the slices of peppers, onion and spinach leaves then roll the pork up tight. Secure with butchers twine. In a separate bowl, add all the ingredients for the dry rub and stir. 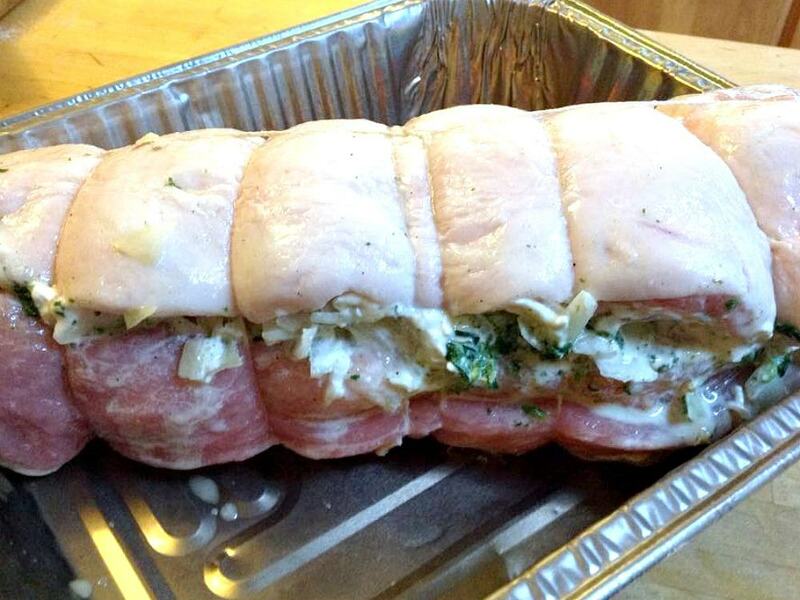 Then in a tray, place the stuffed joint and add the rub mix. Use your hands and rub in to the meat well. Let it rest while you pre heat the oven to 300 F.
Cover the pork with foil and place in the oven. Roast for approximately 2 hours 15 minutes, then remove the foil and cook for a further 20 minutes or until the pork is cooked through, juices run clear when you poke a knife through the center, and the surface is a nice brown color. 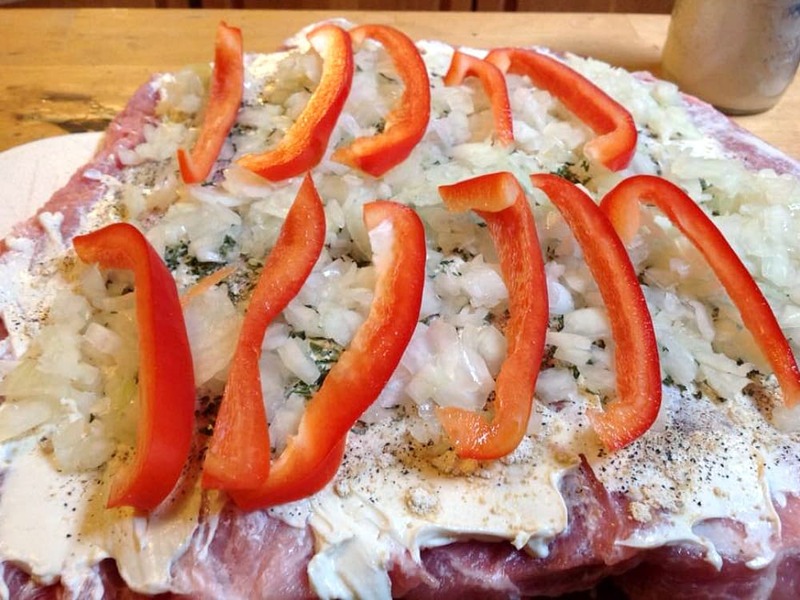 Allow the pork to rest for 20 – 30 minutes then slice and serve.